Designed by Ben Seaborn, Arroyo was launched as We’re Here with sister ship Tola in 1938. Arroyo raced under the Seattle Yacht Club who now sponsors the annual Mark Mayer Race on Lake Washington. Past owners include A.G. Woodley, Carl Jensen, David Skinner and Dr. Robert Smith. Raced in Northwest waters under the names of We’re Here, Oscar IV, Kate and Avolonte. Arroyo participated in many Swiftsure races and in 1949 won the Swiftsure Lightship Race as Avolonte under ownership of A.G. Woodley. As a testimony to it’s racing history a half hull model of Arroyo currently hangs in the Seattle Yacht Club. From 1995-1999 Arroyo underwent a four year complete restoration in Port Townsend under ownership of Roger and Nancy Newell. 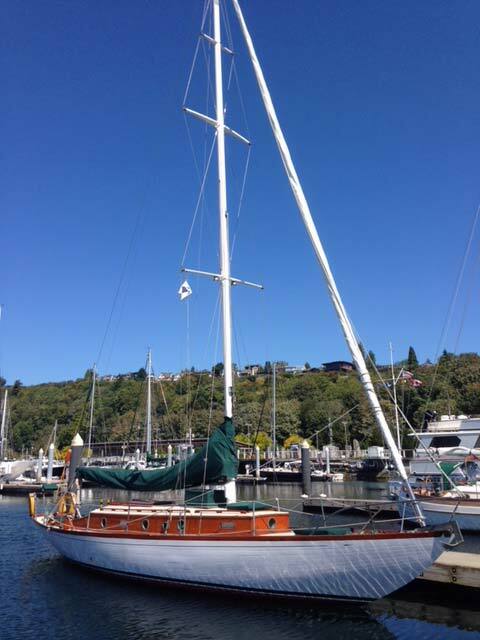 Currently moored on Lake Union not far from the original site of the Blanchard Boat Company, Arroyo continues to sail in Northwest waters and participate in local wooden boat shows. Construction includes cedar planks on oak ribs with silica sand decks on epoxy over okume plywood. Original mast and boom are spruce. The yacht was recently repowered with a 40 hp diesel Yanmar auxiliary engine.